Traveling slowly West across the plains is a young man named Jay, a Scottish aristocrat who finds himself very far from home. After a tragic accident, his love, a poor girl named Rose, was forced to flee with her father across the Atlantic, finding a new home away from the punishment for a crime she didn’t commit. Jay is determined to find her, no matter what the cost, and no matter how little he knows about survival. Luckily, in some ways, he meets up with a rogue gunman named Silas, a trail-wise cowboy who wants to help keep Jay alive, for his own probably ignominious reasons. But Jay doesn’t understand the game, nor has he witnessed the cruelty of this land, something that is bound to catch up with him sooner or later. And in the form of an outlaw leader named Payne, Jay is about to be taught the hardest lesson; that love doesn’t always conquer all. 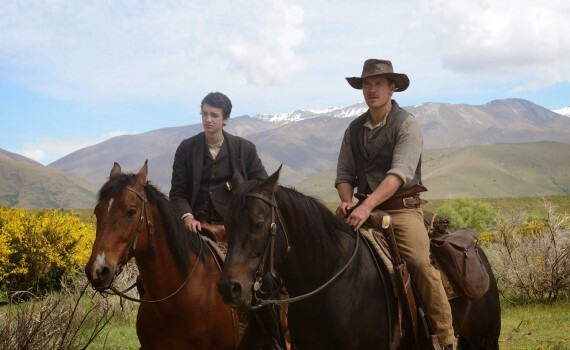 For a first-time writer/director, Maclean does a lot of things right in Slow West. First, he leaves the story classic. Young love, a journey, a seasoned veteran who has a bigger heart than he lets on, an evil gang of wrong-doers; it’s a typical formula, one that couldn’t go too wrong if you just let it play itself out. So Maclean trusts the recipe, throwing in his own flavor slowly, letting us relax & accept the plot as it comes. Genius really, using a light touch to succeed where so many others would have failed. A little humor here & there, a little more character revealing, knowing when to let the scenery speak for itself and when to tell the audience the story; well done all around. And then there’s the acting, which could not possibly have been better. Smit-McPhee, Fassbender, and Mendelsohn were all excellent, sliding into their roles seamlessly and trusting the director to guide them down the right path. The film ended up less bloody & less over-the-top than I had thought it would be, while still reminding me of a dark, Western version of O Brother Where Art Thou. And hey, if he leaned heavily on classic Westerns and mixed the old formula with some Coen Brothers, more credit to him, that’s just smart. That describes the film as a whole; a smart delivery that’s sometimes comic, sometimes heavy, and always entertaining, with a deep core that holds it all in place.